For an artist, finding a new tool to create can be like opening a door to another dimension, or growing another pair of hands. It can fundamentally change your relationship to creating, providing a new language to communicate through. For Pati Hill, a writer on hiatus in her 50s, revolutionary inspiration came by way of the IBM Copier II, which marked the beginning of her foray into visual art and a return to writing after a long hiatus. Hill began producing a flood of inspired images. A talented woman accomplished in a variety of fields – including modeling – Hill found in the photocopier a perfect device for synthesizing her interests into a single visual image. In these images, although they are decades old, remains an excitement of fresh discovery. The work continues to present immediacy, an urgency to communicate through this machine, which she embraced with open arms and rigorous demands. Photocopier, A Survey of Prints and Books (1974 – 83) at Arcadia University presents a surprising and dynamic body of work in an unexpected vehicle: sheets of 8.5 x 11 inch paper. The exhibition spans the gallery and two spaces in a neighboring building, and consists of eleven distinctive clusters of imagery. Hill’s images are understated and archaic, the haze of photocopy toner evoking nostalgia similar to the way sepia toned photographs or Victorian tintypes do. The haze also carries with it an awkward association with contemporary office culture, which sets a strange stage for Hill’s imagery. This mildly bureaucratic wistfulness juxtaposes nicely with the demanding urgency of some of the compositions, and gently complements the more delicate ones. In Hill’s work forms emerge from a spiraling black abyss, flattening as they approach the viewer as if seen trapped beneath ice on a lake. For some, there is a kind of desperation in their advance towards us, pressing and straining against the window of the photocopier. This drama appears most notably in A Swan: An Opera in Nine Chapters, featuring an actual carcass. 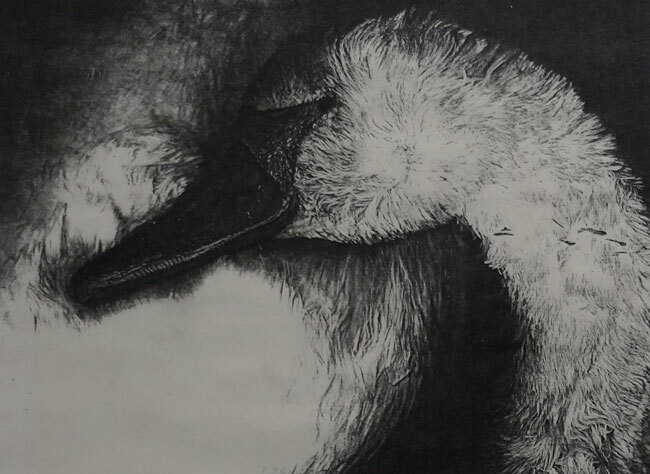 The visceral images of feathers, crumpled and pushing, is at once delicate and violent in its posturing, and the compositions present a kind of sadistic tenderness with their lush chiaroscuro. Exhibition text describes Hill finding the animal’s body on the beach and valiantly heaving it onto the glass of her copier, later enlisting a butcher to expose its internal organs and skeleton for copies. 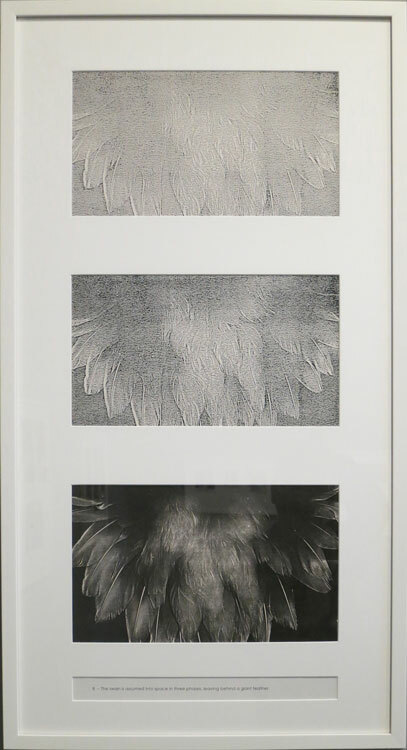 The images are poignant and moving, with delicately articulated feathers weaving across the surface of each photocopy to form abstractions made from bird matter. For others the mechanism distances the viewer from the object, objectively cataloguing it in a standardized format. Hill’s series of garments presents familiar buttonholes and lacings packaged tightly within the format of the page, strangely removed from the viewer like meat packaged for the supermarket in saran wrap and styrofoam. Frailty in the objects is emphasized crudely with the bright flash of the scanner’s light, revealing frayed strands and sensitive textures in such a way to both protect and expose them. The blackness of the composition surrounds the objects protectively, and they are both exposed and preserved by a kind of shrouding mummification. Understanding Your Chinese Scarf, a series of fifteen “poses” of a single fringed, light-colored scarf, allows this frailty to become comical. Its amusingly anthropomorphic iterations of a piece of fabric gives the object a unique character, only visible through the screen of the photocopier. 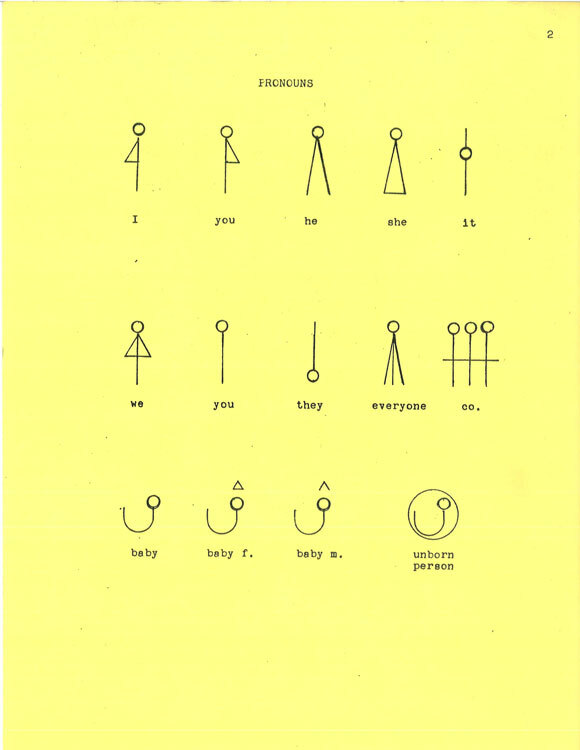 Beyond her copies and writing, exhibition curator Richard Torchia carefully combines other artifacts of Hill’s career to provide a full experience of her questioning nature, including her “Symbol Language,” a small dictionary of Hill’s own invented alphabet for an alternate form of written communication through linear symbols. The simultaneously sincere and playful catalogue of pictographs, nonchalantly displayed among Hill’s other works, is surprising in its depth and consideration. The artist devised the alphabet as an educational tool for young children after noticing her own daughter’s comfort with hieroglyphs and difficulty with grammar. A dynamic energy exists in Photocopier through the tension between the aesthetic intensity of the work and an obvious appreciation for its utilitarian qualities. This, paired with Hill’s frank writing works, maintains a strange sensation of confusion and intrigue. Some pieces feel deeply full, epic in their scope and gravitas, while others are unapologetically questioning and sparse. The text-piece Dreams Objects Moments emerged from Hill’s intense need for a machine of her own. While much of the work in Photocopier was created after IBM loaned her a copier to keep in her Connecticut home in 1977, Hill’s earlier work was made through a combination of visits to copy shops and clandestine after-hour trips to the company’s headquarters. In 1975 she sent numerous letters to IBM asking for a copy machine, all of which were denied. Frustrated by the company’s rejection to her pleas, she created a series of short statements or poems on her feelings about image making with the copier, but “without requiring the use of a copier.” Installed, the poems are color-coded into the three subject categories, printed on different pastel shades of paper – the only color in this otherwise black-and-white exhibition. “I line up my ideas one by one and push them over the edge, but they won’t fly. Rather, they remain suspended like astronauts in the thin air around my head.” The clear connection between this striking line and the visual imagery Hill presents in her copies captures the indelible bond between the artist and her tool. The imagery in the photocopies is also suspended, pushed into black space but unable to fly or fall. There is a singular kind of presence that Hill’s images possess that differs from other forms of image making. It is strange to be presented with such moving imagery given the ubiquity of the photocopy, and it seems to take the unassuming and understated mechanism of the copy machine to present something so pedestrian as simulacra in a fresh way. Perhaps it is because this method of image making has never really become popularized in fine art, and remains Hill’s domain. Or perhaps it is the stark clarity of the artist’s vision, articulated with the finest tool for the job.